‘On the other side of fear lies freedom’ are the words inscribed on a pendant at a gift shop at Vancouver airport where I’m waiting to board my flight back to Mumbai. And as I ponder over adding the piece of jewellery to my shopping bag that’s already filled with maple syrup gummy bears and cute moose magnets, I hark back to my week spent on the west coast of Canada participating in activities I wouldn’t have imagined myself attempting in this lifetime. As a complete scaredy-cat, I’ve never even looked down from the balcony of a high-rise, for fear of falling to my death. But here I was, in the province of British Columbia (BC), making the most of my time in these regions that promise lots of adventure, hoping to overcome my many lifelong fears — and I’m glad I did. On our arrival in Whistler a week prior, my fellow travellers and I are visibly tired. After two long-haul flights and a two-hour-long car ride to the resort town, all we want to do is sink into the cozy beds at the Westin Resort & Spa which is our home for the next two days. But we choose instead to overcome our fatigue and pull through the evening with a walk around the main village. The scent of maple and lavender emanating from souvenir stores follows us around the cobbled streets, while we observe people with their mountain bikes and adventure gear heading back home after a long day. No matter where we look, the mountains are part of our view, the snow melting down the peaks making for arresting images in the calming Whistler sunset. After photo ops with the intricately carved Welcome Pole in the centre of the village — totem poles are frequent sightings here, owing to the legacy of the indigenous First Nations people — we settle down at a local cafe for some delicious poutine. French fries, melted cheese curds, and delectable gravy — what’s not to love? I devour my meal, trying to focus all my attention on the fries instead of the thought that I am scheduled to go zip-lining across the mountains the next day (a fact that’s made me so nervous, the others have to remind me that the rope can’t snap that easily and that it’s probably going to be more fun than anything else). And boy, how right they prove to be. The next morning, as we stand in front of our zip-lining gear, I’m shivering partly from the cold and partly because I’m in half a mind to run away and go sip on some hot cocoa instead. ‘You can do this, come on!’…‘Don’t miss the chance, it’ll be amazing’ — I remember all the messages that I woke up to from my friends and family back home, and decide that this is probably a once-in-a-lifetime experience, so I might as well go all out. The Ziptrek Ecotours trail this morning includes five zip-lines at Whistler Mountain, each one getting progressively longer and higher, with short walks through the tree trails between each line. As our van stops when we reach the mountain, my shivering has increased, my hands are freezing and I’m now a bundle of nerves. And the fact that the guides (and other travellers in our group) put up with the nervous wreck that I am for the next three hours with utmost patience and encouragement is deserving of some award in my opinion. Holding on for dear life at the first line, I feel freer as I whiz past the trees on either side. And though I get more confident with each zip-line, my nervousness intensifies too, seeing the increasing height and distance — “You can do this now” are the only words playing through my head as I go along. We are surrounded by gorgeous vistas of mountains around us and the gushing waters of the river below, and here I am, gliding through it all, like a bird. The last stretch is shorter than the rest, and a photographer waits at the other end — I’m all smiles for her as I conquer this one, letting her capture me in all my wind-swept glory (also because I am 100 per cent sure no one would believe what I attempted that morning if I didn’t have pictures to prove it!). “Let’s do that again!” I say, as we return to the main village for our next activity, a ride from Whistler Peak to Blackcomb Mountain by way of a glass-bottomed gondola, or cable car. But when we’re at the top waiting for our gondola to arrive, I’m once again crippled by my fear of heights, and I mentally decide to sit in the cabin with my eyes tightly shut, or just look up at the clouds instead of down below. But Whistler’s natural beauty compels me to whip out my camera and forget all about being 1,400 feet above the ground. A shining silver gondola arrives and we quickly get on as it pulls out of the station with a jerk, taking us on a three-kilometre ride to Blackcomb on the other end. The glass bottom offers us top views of the verdant forests below, with waterbodies winding through them on occasion. 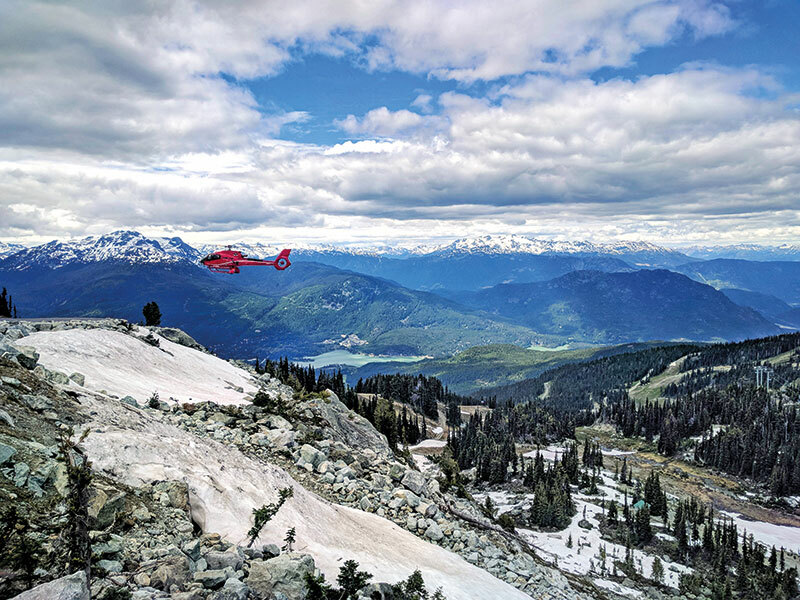 As we get off at Blackcomb Mountain, we are treated to views of more snow-capped peaks and sea-green lakes, and a helicopter in the distance adds a dash of red to the hues of green and blue. “This looks like something straight out of a dream,” I tell myself, as I capture the moment for posterity. After a quick lunch at the mountaintop cafe, we head back down in a six-seater cable car, and as we reach closer to ground level, we spot a brown bear far in the distance! It is but a dot in the photos we click from our vehicle, but little do we know that it’s not the last we’ve seen of the furry creature. An hour later, we’re seated on our own ATVs — all-terrain vehicles or quad bikes — to ride through the mountains. With my sporting gloves on, and helmet tightly fastened, I feel like I’m part of an action movie and though I’m a bit nervous about operating the four-wheeler myself, I’m more than excited to test my driving skills on the machine. And it turns out to be one of the most enjoyable moments of my life. We steer through the mountain road, sometimes along muddy patches and rocky paths, stopping at intervals for photo ops — and once for a sighting of a black bear walking through the forest just a few feet from us! We are lucky to have had this experience, and although treated to several captivating views of Whistler during our ATV ride, I consider that bear sighting my favourite moment. A scrumptious Italian feast at the famed Umberto Menghi’s Il Caminetto restaurant ends our day, as we recount our adventures while sipping on local wines. The V2V ferry takes three hours to get to Victoria, the capital of BC and our home for the next two nights. The first thing you notice about Vancouver Island’s largest city is the abundance of flowers, and the architecture that’s reminiscent of British colonial buildings. From the pathways to the gardens, from the downtown waterfront to the parks that dot the city, flowers of all kinds and colours greet you in Victoria. “It’s the city of newlyweds and ‘nearly-deads’!” our driver for the day explains. It’s mostly young couples and retirees who choose to make a home here, he tells us, as he takes us to the seafront to catch our boat for a morning of whale watching. It’s a windy, cloudy, and relatively cold day — probably not the best weather to look for whales far out in the ocean, but we set out hoping for the best. As I step onto our boat, Pacific Explorer I, it rocks back and forth and my nerves set in once again. 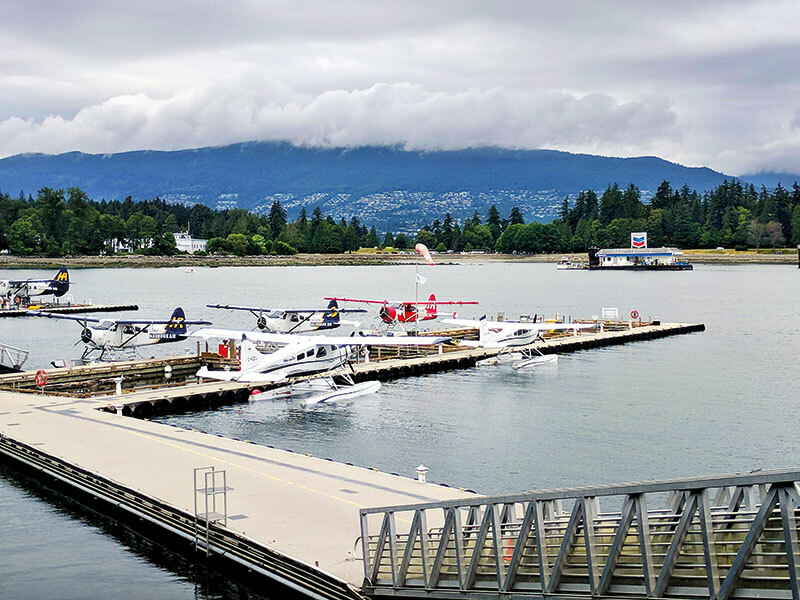 Having been on cruise ships before, and living by the sea, I am not afraid of water bodies — but it’s more often than not that tiny boats are known to capsize, and being swallowed by a whale in the Inner Harbour of Victoria isn’t how I picture my life ending. Though the wind rocks the boat a little too much for my liking, I cover my ears tightly with my shawl and choose to sit on the top deck. After we say hello to some sea otters and seals resting on the rocks, our boat stops for a while somewhere in the middle of the Juan de Fuca Strait and in a few minutes, we spot two giant orca whales a few feet away. And then two more. Followed by a couple of others in the distance. They’re probably pairs of mother and child, we’re told (we also learn that an orca has to take permission from the mother of the whale he wants to mate with before doing so). And to think I almost didn’t want the boat to leave the shore! I am more than delighted to catch such amazing views of the orcas, all my memories of watching Free Willy (1993) as a child coming to life in that moment. Still in disbelief and awe on sighting so many orca whales that morning, I’m in for more surprises when we head to Victoria Butterfly Gardens — to reach the main atrium, you have to pass through an Insectarium. Giant spiders, scorpions, beetles, moths and ants are all part of my worst nightmare — and here I am, separated from them by mere glass barriers. “You zip-lined across a mountain two days ago, you can do this too!” I assure myself. Though I’m scared out of my wits when the scorpion that I’m trying to locate by sticking my nose to the glass jumps out at me suddenly, I manage to make my way through the alley of insects. “At least it can’t touch you,” I pacify the scaredy-cat in me. But on the other side of the door, the unexpected awaits. There are thousands of butterflies of all species fluttering around in what is a replica of a rainforest — lush green plants, flowers of all kinds, flamingoes, tortoises, parrots, blue-and-yellow frogs, tropical ducks and even a resident iguana, all add to the riot of colour. We spend close to an hour here, posing for photos but all the while wary of being ambushed by hordes of butterflies! We pass several minutes watching a tortoise trying to climb a small rock, rooting for him at every step and cheering as he emerges victorious! 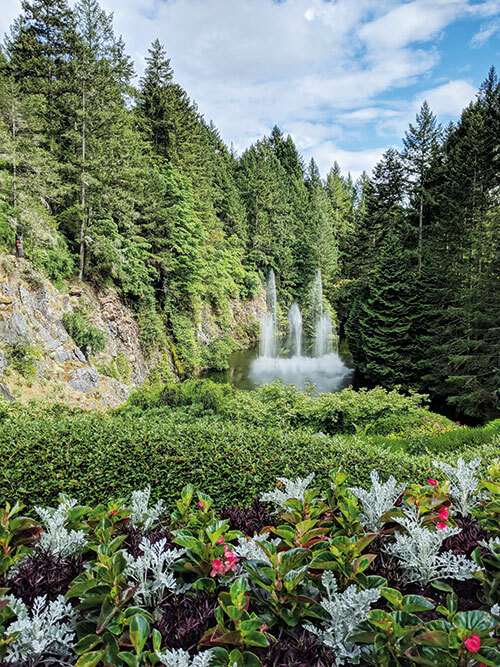 We round off our time in Victoria with a trip to the famed Butchart Gardens — a 55-acre expanse of gorgeous flowers of all species, founded over a 100 years ago by the Butcharts. With over a million visitors a year, this is Victoria’s most popular locale, and it’s not hard to see why, with its resplendent blossoms everywhere you look. We roam through the different ‘mini-gardens’, from the lovely Rose Garden and the Japanese Garden to the Sunken one, ending at the Italian Garden, where I enjoy the view of vibrant blooms, as I savour a double scoop of hazelnut-chocolate gelato from the garden gelateria. A seaplane takes us from Victoria back to the final destination of our trip, and this time, though my fear is apparent (it doesn’t help when the plane vibrates every time someone moves even an inch), I am also quite excited to have my first experience taking off from and landing on water. And 30 minutes later, as we arrive with a splash (quite literally), all I want to do is get back on the plane for another ride! But little do I know, my battle with my fears is not over. “Stop shaking it!… Please don’t move! 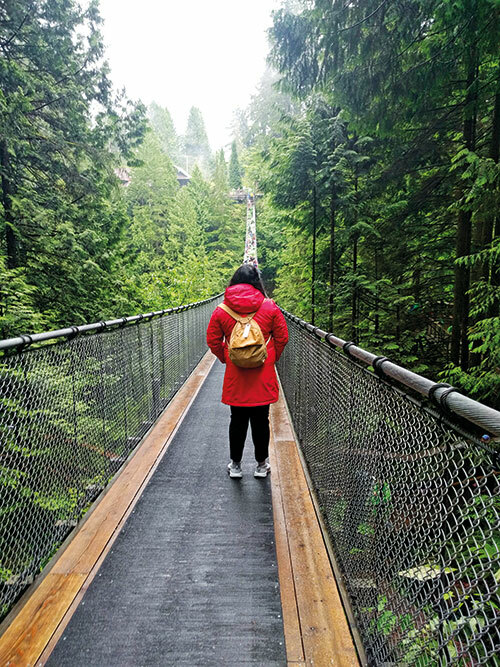 Don’t do that or we’ll fall,” are the only words I manage to say as we walk across the Capilano Suspension Bridge that rainy afternoon. A 450-foot-long walkway, the bridge made of wire cables is built 70 feet above the river that it takes its name from. 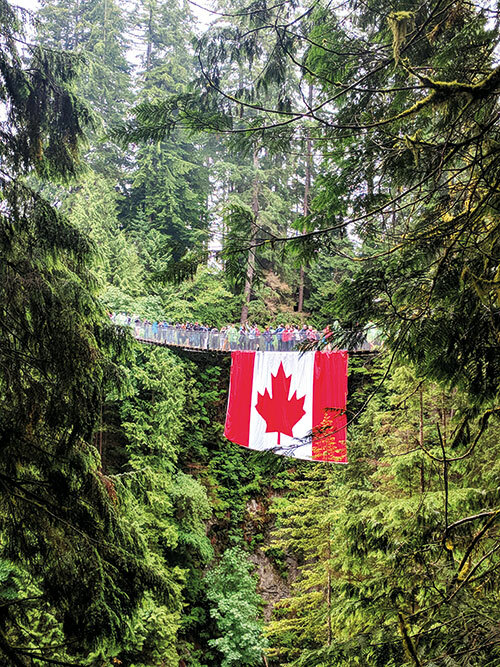 This ‘swinging’ bridge is housed in the Capilano Suspension Bridge Park, where one can also walk around learning about the bridge’s history, take nature trails, or simply admire the vibrant totem poles that dot the park. But today, this bridge is my Everest that I have to conquer — one hand clutching my umbrella and the other holding onto the railing for dear life. It doesn’t help that my friend behind me is rattling the bridge for her amusement. My greatest achievement that day? Taking my hands off the railings and balancing on the shaking bridge to pose for a photo as we reach the middle, with the freshly-wet greenery all around making for the perfect backdrop. As we step into the Skyride at the base level of Grouse Mountain, we’re hoping against hope that the skies will clear up. It’s been raining all day, and the fog and dew prevent us from catching a perfect view of the city as the cable car rises 4,000 feet to reach what is the Peak of Vancouver. But after a quick meal at the Altitudes Bistro at the top, what we are headed to see is nothing short of spectacular. We follow the animal foot prints that are imprinted into the ground to mark the way to the bear habitat, but we can barely see a few feet ahead of us owing to the intense fog that’s taken over. We can even ‘see’ our breath with every step we take, because of the freezing cold air. Following forty minutes of extreme patience and disappointment, the fog clears a little…and from behind the trees emerges a fat, brown, grizzly bear. “That’s Grinder, the grizzly we found in 2001,” the park ranger tells us. “And it’s your lucky day, because behind him comes Coola! He’s the bigger one, but Grinder is the one who’ll start all the fights.” Two grizzly bears just five feet away from us right when the fog started fading away, it really is a lucky day! At the airport the next morning, I’m holding this pendant in my hand, wondering if it’s a good purchase. “This week you went zip-lining, rode an ATV through the mountains, sat in a glass-bottomed cable car and a sea plane, roamed a room full of insects, balanced on a swinging bridge 70 feet above a river, and saw bears up-close,” I remind myself as I buy it. I sure had earned this gift to myself after this cathartic journey. Canada, I learnt, is a land of expansive beauty and wildlife, glimpses of which can, more often than not, take your breath away. But most of all, it’s the place that had finally freed me from my lifelong fears. STAY at the Hyatt Regency in Vancouver, a stone’s throw from the main waterfront. VISIT Munro’s Books in Victoria, set up by Nobel Prize winner Alice Munro and her first husband in 1963. EAT at Coast in downtown Vancouver, an award-winning restaurant where you can savour local seafood delicacies. SHOP for maple syrup in maple-leaf-shaped glass bottles, Inukshuk figurines and magnets or jewellery that incorporate First Nations culture.